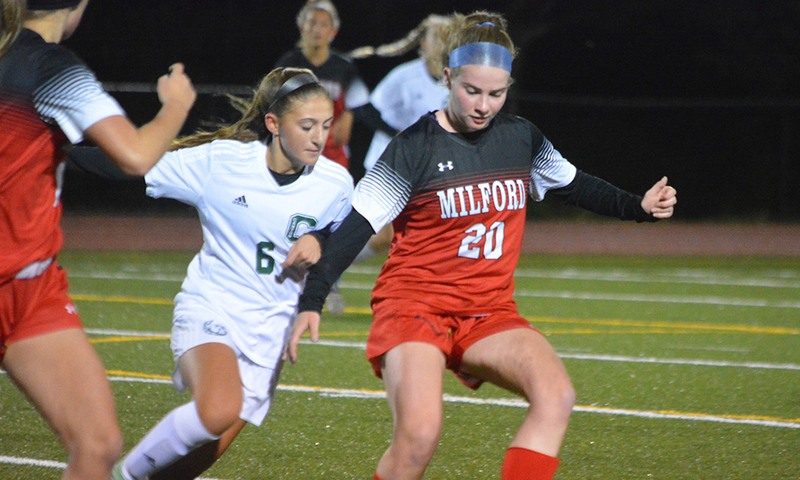 Attleboro, 0 @ Milford, 6 – Final – Milford built a 4-0 lead by halftime and never looked back, knocking off Attleboro and qualifying for the state tournament for the first time in five years. Walisson de Oliveira had a hat trick while Rande Monahan and Gabe Alvarenga each scored their first goals. Zach Browne had a standout game defensively, and Josh Orellana and Cam Doherty combined for the clean sheet in net. King Philip, 1 @ Foxboro, 4 – Final – Click here for a recap and photo gallery from this game. Franklin, 1 @ Sharon, 0 – Final – Franklin senior Tim Duval scored just over two minutes into the game and the Panthers held on to that score for the rest of the way to earn two points. Mansfield, 2 @ North Attleboro, 1 – Final – Mansfield netted a pair of first half goals and then fended off the Rocketeers in the second to get the win. Luke Savoie opened the scoring in the 2nd minute, hitting a hard shot from the left side to the far corner. In the 29th minute, junior Peter Oldow cleaned up a loose ball in the box to make it 2-0. North cut the deficit in half in the 59th minute when Joe Hilf scored off a corner kick from Joey Coscarella. Milford, 3 @ Attleboro, 4 – Final – Isabella Salviati scored a hat trick and assisted on another and Briley Harnois assisted on two and scored one for the Bombardiers, who get back to .500 on the season with the win. A Salviati brace had Attleboro up two goals in the opening 15 minutes, but Juliana France cut the lead in half before the half-hour mark. Harnois made it 3-1 off a Salviati assist but just 30 seconds later Sofia Wilson again brought the Hawks back within one. Salviati scored the eventual game-winner off an assist by Jessica Gates with 19 minutes left. Cassie Probert added Milford’s third in the closing seconds. Foxboro, 5 @ King Philip, 2 – Final – Jordyn Collins scored a hat trick for the Warriors, who stayed unbeaten with a win over last year’s Kelley-Rex co-champs. KP jumped out to a 2-0 lead behind goals from Avery Snead and Chloe Layne (assisted by Ally Armstrong), but Collins scored three times before the break to put Foxboro in front. In the second half, Mackenzi Fraser (from Meghan Burke) and Alyssa VandenBoom (assisted by Kailee McCabe) scored to put the game away for Foxboro. Sharon, 0 @ Franklin, 3 – Final – Anna Balkus scored a brace to lift the Panthers to the victory and keep Franklin within just two points of league-leading Mansfield. Freshman Riley Fitzpatrick marked her varsity debut with her first career goal. Calen Frongillo, Sydney St. Marie and Hailey Toolin each recorded assists for the Panthers. Breanna Atwood made three saves for the clean sheet and Lydia Chase made 19 saves for the Eagles. North Attleboro, 0 @ Mansfield, 0 – Final – Click here for a Recap and Photo Gallery from this game. Taunton, 184 @ Canton, 158 – Final – Canton’s Thomas Singleton earned match medalist honors, the lone Bulldog to eclipse the 40-mark in a win over Taunton. Singleton carded a 37, Chris Lavoie and Mike Leonetti each chipped in with a 40, and Tommy Dimock shot a 41. King Philip, 169 @ Oliver Ames, 148 – Final – Nolan Donze earned medalist honors to the second straight OA match, this time sharing the honors with Jared Spillane. Donze and Spillane each shot 36 while Liam Barry and Ryan Bock each carded 38. 2017 Finish: Reached Div. 2 South First Round. Canton has been on the cusp of getting back to the top of the Davenport division in recent seasons and on their day the Bulldogs can be very difficult to play against. As one of the favorites for the league title this fall, consistency will be the biggest challenge for Canton as it tries to unseat North Attleboro at the top of the Davenport standings. To get the attack in gear, Canton will be turning again to its youth. The Bulldogs will look to sophomores Olivia Rodman and Elisa Diletizia to run at opposing defenses and continue developing a partnership that was one of the most potent in the league last fall. Senior defender Sarah Collins will be the leader of the Canton defense, which will look to improve on the 34 goals allowed from last season. Junior Morgan McCabe will be stepping into a larger role this season, with her versatility as a forward or midfielder, and senior Julia Hamilton adds tenacity in the center of the pitch. Last year was a transition season for Foxboro under first-year head coach Katie Stalcup, as a group of talented young players made their debuts at the varsity level. The Warriors improved over the course of the season, made the playoffs, and now with a year of experience for a young squad there is a lot of buzz about Foxboro this fall. The graduation of Lily Sykes, who was one of the league’s top players for all four years of her career, leaves big shoes to fill, but Foxboro has a number of players with potential to make up some of her production. Senior Mackenzi Fraser will be the main striker for Foxboro this year but sophomore Jordyn Collins will add speed on the wing and freshman Kaitryn Franchino will contribute up top as well. Junior Kendra Wentling returns in the midfield and freshman Kailee McCabe is a player to watch in the center of the pitch. Defensively, Foxboro has a lot of experience in senior Alex Stamatos, who will be joined in the back line by junior Yara Fawaz. Sophomore Morgan Sylvestre will be in net again this fall. For the past several seasons, Milford has been on the verge of getting back to the playoffs and now new coach Lou Colabello, who formerly coached at Douglas, will look to push the Hawks up the league standings with a number of experienced players in key positions. The midfield will be patrolled by seniors Siena Pierce and Cassie Probert and junior playmaker Juliana France, who was named a league all-star as a sophomore and demonstrated the ability to cover a lot of ground in the middle of the pitch. The Hawks scored only 24 goals last season, so the attacking unit will be hoping to step it up this year, including senior Hannah Martin and junior Ashleigh Starks. The defense also has plenty of experience with junior Olivia Marshall back in goal and her classmates Maddie Boyle and Annie Flanagan in front of her to keep things organized at the back. 2017 Finish: Reached Div. 1 South Quarterfinal. North Attleboro will need a number of players to step into bigger roles this season, if the Rocketeers are going to make it three league titles in a row. North graduated 14 seniors and eight starters from last year’s team, but there are a number of familiar names and big contributors who are back and aiming for a three-peat. The Rocketeers scored 60 goals last year and senior Ashlyn Gaulin contributed on 27 of those (17 goals and 10 assists). She will be the focal point of the attack this season, after the graduation of 100-point scorer Haley Guertin, and her sister Emma will try to provide the assists from the midfield. Seniors Kayla Pasquel and Haley Ferris will add to the experience in the center of the pitch for North and classmates Morgan Silver, Liz Smahi, Lexi Sinacola, and Lauren Pezzi will add depth in the midfield and defense. Seniors Sam Hawkins and Brieann Westcott will be at heart of the defensive unit with classmate Emma Noreck in goal. Sharon alum Catherine Sullivan takes over the program this season, as the Eagles look to rebuild and work towards a return to the state tournament. With the graduation of Ali Filipkowski, Sharon lost a lot of firepower but Sullivan is excited about the potential and the growth of the team during the preseason. One of the key returning players is senior goalie Lydia Chase, who is a fearless shot stopper and her distribution will be important for the Eagles’ transition game. In front of Chase, senior Rose Wald is back in the heart of the defense and will partner with sophomore Molly McAlevey, who is a newcomer to the varsity but already showing a lot of composure on the ball. The midfield engine is senior Maxine Gordon, who will drive the Eagles forward, and junior Bella Berger will add playmaking and vision in the center of the pitch. Senior Bridget McManus will be the main forward and she will be expected to not only provide goals but also set up her teammates and get others involved in the attack. Although Stoughton was unable to pick up an elusive league win last season, Black Knights coach Tara Daniels felt that there was progress from the team, particularly in attack. A group of speedy, young attackers made Stoughton a more dangerous team and that experience has Daniels hopeful for even more in 2018. Speed on the edges is going to be a key strength for the Black Knights this season led by senior outside back Cintia Khouzami and sophomore Nikki Anderson, who has gained a lot of confidence after playing a lot of minutes as a freshman. In the heart of the defense, senior Corina Kavanagh will be the leader of the group, ensuring everyone is organized. Sophomore Mackenzie Manning is another player who grew a lot over the course of her rookie season and will again be the primary playmaker for the Black Knights and a key to keeping possession. Senior Gabriela Diaz played a lot at the back last season, but this year her speed will be utilized up front to create even more opportunities.